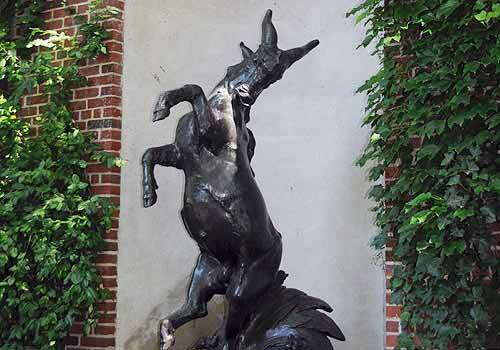 This whimsical bronze statue is part of a pair of niche sculptures that flank the buildings in the Central Park Zoo. The Dancing Goat stands at the south side, with the Honey Bear at the north. Cast at Roman Bronze Works in Brooklyn and installed in 1937, the sculptures serve as decorative fountains. Placed in basins at the sides of the zoo's Dancing Crane Cafe, both animals stand on their hind legs. Water sprays from five ducks at the feet of the goat, and from five small frogs at the feet of the bear. The lighthearted pieces were created by renowned animal sculptor and Brooklyn native Frederick George Richard Roth. They are among several Roth works acquired by Central Park in the 1920s and 1930s. (Among them is Balto, the statue of the legendary Alaskan husky). Central Park Conservancy refurbished the sculptures in 1993, and today Roth's pieces continue to delight Park and Zoo visitors of all ages. Inside the Central Park Wildlife Conservation Center at 64th Street and Fifth Avenue.